I have to thank Rose books for that. Her books have given me wings to fly within my baking world. In the past 3 years, I learned so many new techniques and flavors combinations, that as a home baker, I truly would never have even had the guts to even try. I have truly become a fearless baker, (a picking one too, but that’s for another post). So when I got The Baking Bible, the Breads and Yeast Pastries section on the book is the one that called out to me the most. Cookies, cakes, pies – done and done. But breads? It’s like a mystical river, calling out to me to dip my feet in its unknown waters. So when I saw what was up next in this week in our Baking Bible bake along, I figure, this is going to be good. 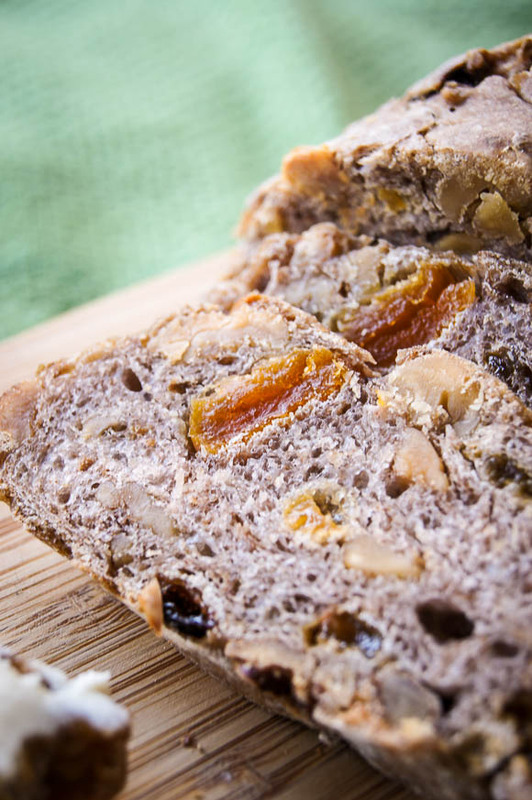 Bread that was made walnuts, apricots, and golden raisins…what is not to like? It sounded so very weird, but so good at the same time. I had high hopes for it. It took 2 days to make this one..
First you have to make the Biga, using bread and Pumpernickel flour, water, yeast and salt. I was going to start my Biga mixture earlier in the week and let it rest the recommended 3-days, but I was sick most of last week and in no mood to see food or my kitchen. So I push it back and made it on Saturday morning, which was the first day I felt human, and let it rest the recommended 6 hours at room temperature and then into the refrigerator for a 1-day cold rest. Then on Sunday I did the rest. And the rest is pretty easy – you add the dough ingredients, more yeast, flour, water, salt to the Biga and then incorporating the walnuts and raisins. Time for its first proof. You then move it around a bit, and let it rest some more time to proof again. Then you move it again, add the apricots and do some fancy shaping, the ruler came out to make sure the bread was the intended 10x3x2 size and let it be for its final proof. The oven was prep like we did when baking the Panettone. Pizza stone in, ice cubes ready to create steam and temperature super high. I made sure to have the oven super hot (something that I think I failed with my Panettone), so even after hearing the bell to indiate it had it reached it temperature, I wainted almost 20 more minutes before I gave the bread a final water mist, slash it 3 times across the top and quickly, wishing you had more than 2 hands to do everything you need to do in this step; opened oven door, set baking sheet with the bread on top of hot stone, tossed the ice cubes inside and close the door up. And did a dance around my kitchen when I heard the steam created by the ice cutes. It’s like a baking ballet guys. Practice makes you more coordinated that you think you are. My bread behaved as it should inside the hot oven and after 45 minutes, hit its internal temperature. Out it came, in the rack to cool. I was so excited about this one – specially since the last 10 minutes of baking time, my house smelled of fresh baked bread, if I closed my eyes, I could transport myself back to my time living in Italy and going by the bakery in early morning and smelling all those sweet aromas of fresh pastry and breads in the air. I did not wait the 2-hour resting time. I cut into it 20 minutes into resting time. And … and… was not wowed at all. I took another bite, and same thing. Nothing. It has a nice crunchy texture (thank you walnuts! ), it was dense inside, but I expected that, being a rye bread it was not going to be super airy. But it was tasteless – almost like it needed a bit of sugar? The apricots and raisins were not enough to carry that note forward. I wanted to give is another chance and I had some goat cheese, so I tried a slice with it and drizzled some honey, and it was better – but there was still an aftertaste that I just could not get past. My husband liked it, but said he was not impressed with it. So sadly this one got marked in the book with a thumb down – sorry Rose. Disclaimer: As previously noted, no recipes are shared in my Cake Bible posts, due to publishing restrictions enforced by the publisher of Rose’s The Baking Bible. But, you can support me and her bypurchasing the book.